Wavy hair can be difficult to style. Blow-drying hair that is half straight and half curly can leave it frizzy, while air drying can leave it limp and dull. A diffuser attachment for your blow dryer can help. It diffuses the pressure of the air and concentrates the heat, leaving you with waves that are natural and soft. Follow a few techniques to get the wavy style that you want. Blot your hair dry with a towel, rather than rubbing it. Rubbing your hair or twisting it up in a towel can roughen the hair shaft, causing it to frizz when dry. Instead, cup the hair in your towel-covered hand and gently squeeze out excess water. Rake a styling creme or spray through your hair with your fingers. Apply a quarter-sized dollop of product and rub it between your palms. Place your fingertips at the top of your scalp and rake it backward, working the product through to the ends. Attach the diffuser to your blow dryer. Plug it in and flip your head upside down. Use the diffuser to cup a small section of your hair, making sure that the hair is within the fingers. 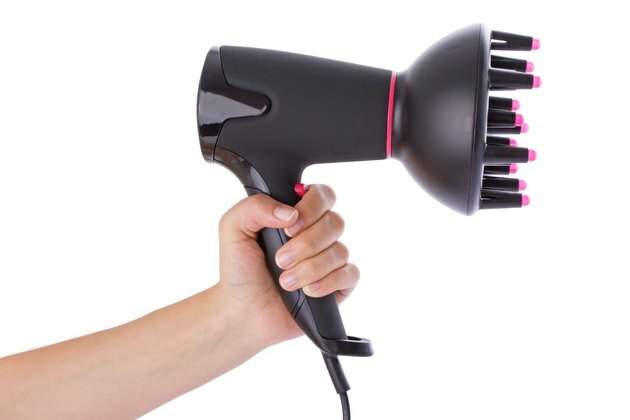 Turn the hairdryer on so that the diffuser begins blowing heat on the section of hair. Hold the diffuser in place for a minute or so until the section is dry. Do not move it all over your hair as you would a hair dryer. Move on to another section until all of your hair is dry. You may move the diffuser in a small, circular motion while you are cupping a section to shorten the drying time. Turn the diffuser off and flip your head back up. Add a few curls with a curling iron to make the waves more pronounced, or simply apply a finishing spray to hold your wavy style in place.